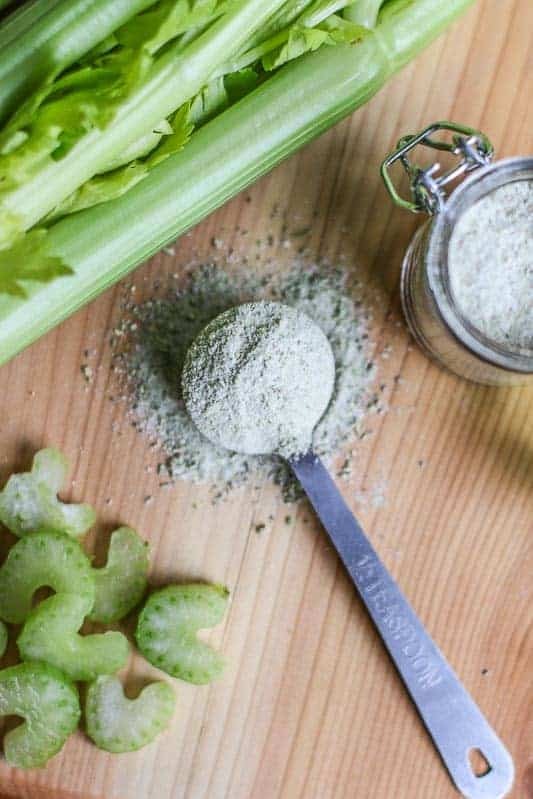 Learn how to make celery salt from scratch. 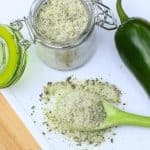 Homemade celery salt is so much more flavorful and tasty than the store bought version. Use it to spice up dishes, flavor vegetables, or season a Bloody Mary! Yum! Celery salt is a great way to enhance a dish and give it that extra bit of missing “umpf.” In addition to vegetables, soups, and salad dressings, I like to add it to popcorn, cole slaw, homemade cocktail sauce and Bloody Marys. It really gives a big flavor pop! My husband hates the texture of fresh celery because of the crunch and thready ribs, but he likes the flavor. Therefore, he enjoys celery salt. 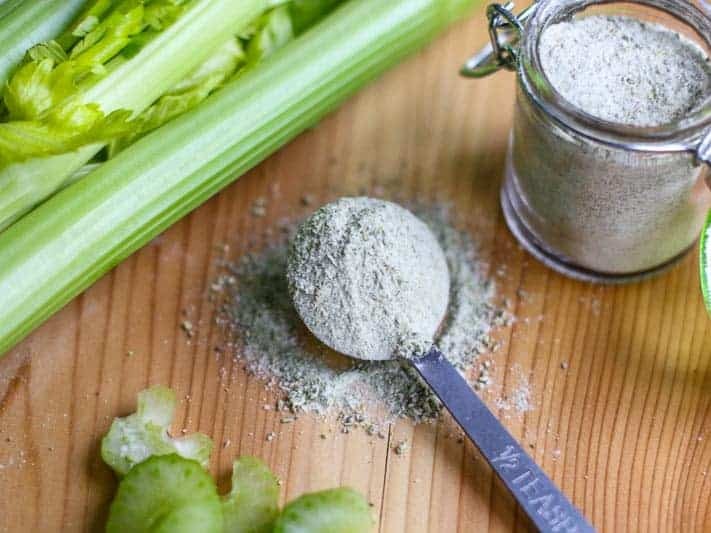 So unless I am going to cook down and soften the celery when a recipe requires it, I will often substitute celery salt when cooking for him. I have found often that celery salt can be a pricey in the stores. I couldn’t imagine why? 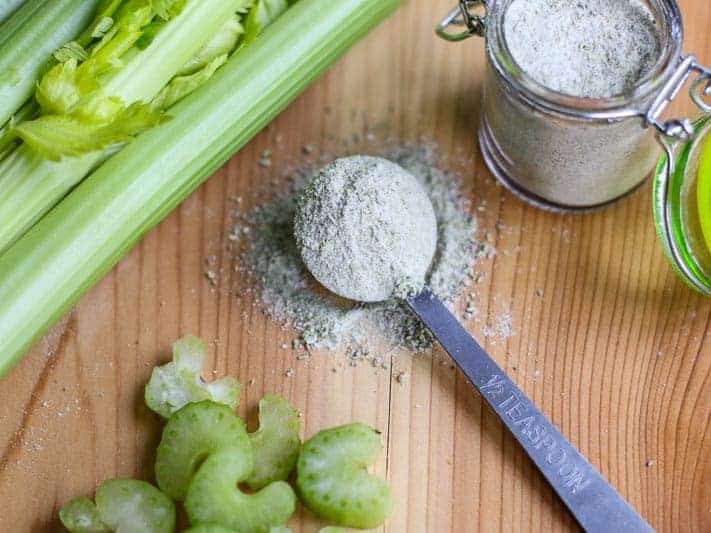 I mean it is just celery and salt… those things are pretty cheap right? I had already been getting carried away making homemade mushroom salt and jalapeño salt(my new favorite spice in the kitchen). I thought, why not make homemade celery salt? It is super easy to make and incredibly flavorful. It tastes like you just cut that celery out of the garden and put it in a jar. I have been giving away my salts to friends and family. They love me for it. I think I will try making garlic salt next… If these homemade salts turned out so good, I can only imagine homemade garlic salt would be a winner also! If you make any of my salts, let me know. I would love to hear back from you. Happy eating! xoxo. Dehydrate celery according to manufacturer's settings. 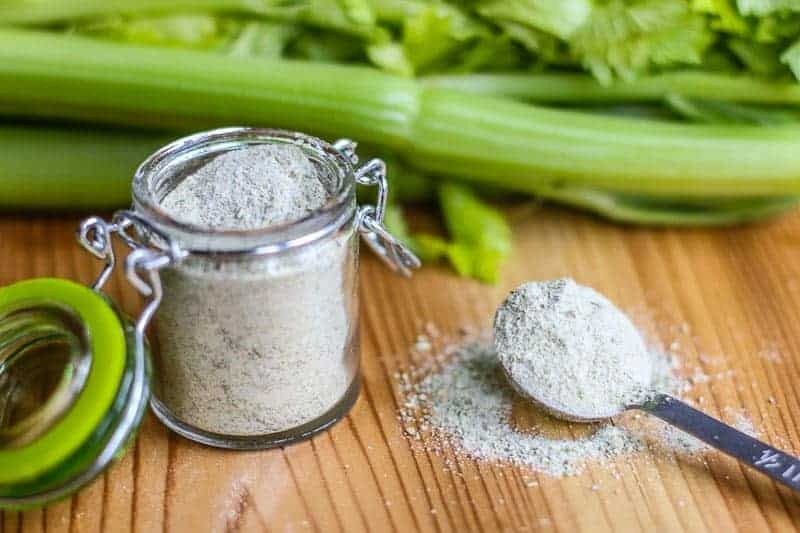 Grind celery, celery seed, and salt in blender or food processor.